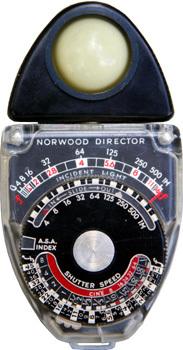 Norwood made four versions of this meter with the same basic design: the Model B, Model C, Model D and the M2. After that it would become the Sekonic Studio, but that's another story. The difference between these Norwood models is negligable. The Model C was simply the B with a new name plate to reflect the company's name change from American Bolex to Director Products. The Model M2 was a Model D with a new nameplate reflecting the company's name change to Brockway (even though the Model D says "Brockway" on the front). But the Model C actually had something new besides the company name and a revised nameplate: it was the first Color-matic. Color-Matic was a gimmick feature to cash in on the growing popularity of Kodachrome film, which was available at ASA 10. Norwood came out with a special slide that was set for ASA 10 at 1/50th. It was painted red so you couldn't mistake it for anything else (the normal slides were black). If you used that slide, you could direct-read the new ƒ/stop scale next to the meter needle. 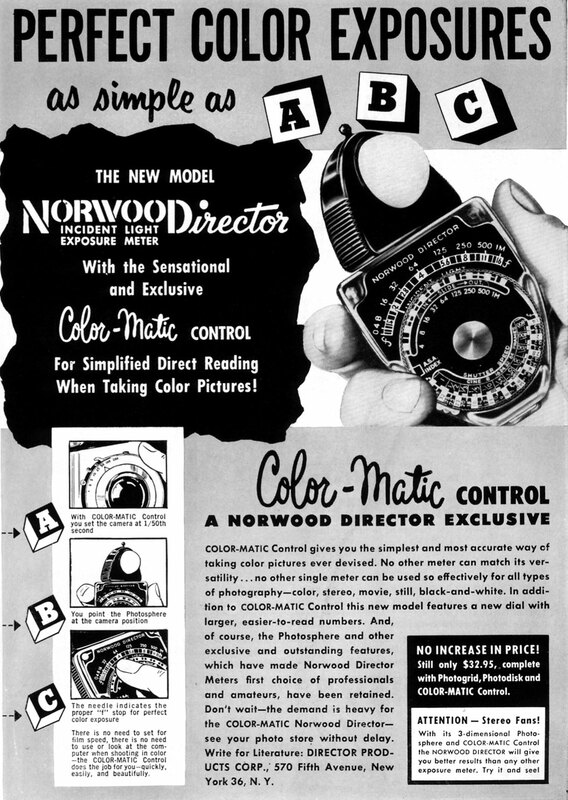 The Model C (the later ones, at least) offered this feature, but it wasn't until the Model D that they were officially called Color-Matics. This meter suffers from the same problems that afflict the previous version: the calculator dial has tiny numerals and it can be tough to read. I have a lot of trouble reading the ASA indicator in anything but very bright light. The Sekonic version had a revised dial and the ASA indicator was a bit more legible. For more background please see The Many Faces of the Norwood Director, or check out some other sites on my Resources page.